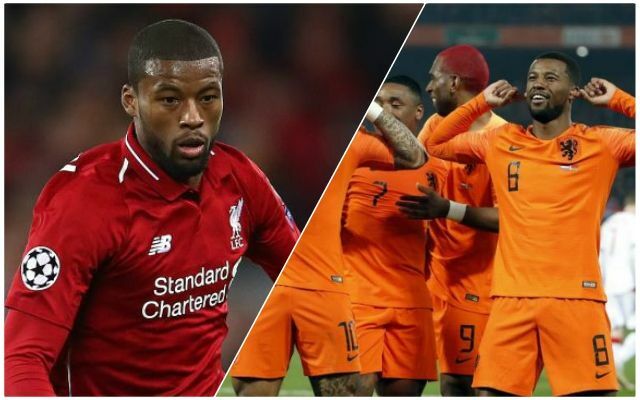 The Netherlands beat Belarus 4-0 last night and two of our boys were on the scoresheet – Georginio Wijnaldum swept it past the ‘keeper inside the box, while Virgil Van Dijk nodded in the fourth. Wijnaldum, in particular, had Reds fans singing his praises and not just for finding the target; he was a commanding presence all night and earned the penalty that Memphis Depay converted. Us Reds fans were obviously made up to see the two Dutchmen scoring, but Gini smashing one home has an extra resonance. Before arriving at Liverpool, Gini’s time at Newcastle saw him playing in a more attacking midfield role netting 11 goals in his one season there. In contrast, Klopp has used his athleticism and stamina to establish him as more of an anchoring midfield threat (with the occasional bursts forward, of course). We love Gini, but he needs to let loose and score a few more goals. This is a bit harsh to be fair, but it does show that fans want him to the two goals he’s scored this season for Liverpool. It’s quite clear that Gini Wijnaldum isn’t a bad player, he’s obviously being told to play more conservatively for Liverpool. Can’t see why he isn’t given the freedom he’s given for Holland for us,especially when playing alongside two defensively minded midfielders. That’s more like it, James! Jürgen needs a collective, ball-winning effort in the middle of the park to release it out wide to our full-backs or to send it up to Sadio Mané and Mohamed Salah to play through the lines. If only he doesn’t have to cover for our fullback all the time. Our Fullbacks play more advanced than some of our midfilders. Whiles when he’s playing for Holland, he has the licence to get into the box more. Again, harsh but maybe true. That goal he scored against Bournemouth was absolutely sublime though. Gini’s tactical responsibilty at Liverpool, in a midfield three, forces him into that “workhorse” label where he’s winning the ball. For the Netherlands, Gini is essentially playing in a central attacking midfield role alongside Steven Bergwijn and Ryan Babel. Basically, he’s playing in Roberto Firmino’s position behind Salah when we play a 4-2-3-1! Maybe his performances will turn Klopp’s head, but the German has his plans for Wijnaldum.